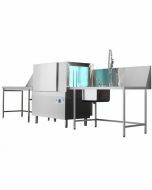 Mach Rack Conveyor dishwashers (commonly referred to as flight dishwashers) are high capacity commercial machines, designed specifically for larger customers that require high capacity washing for a large number of dishes in a specific washing area. Highly configurable, rack conveyor dishwashers are uniquely specified to a customer's requirement, through a wide range of additional options, configuration points and accessories including roller tables and pre-wash tables. Ranging from compact washing and rinse machines with a capacity of 55-80 baskets per hour that are ideal for hotels and business canteens to larger, high-performance machines with a capacity of 64-98 racks per hour, ideal for larger hotels, schools and hospitals. A truly high-quality commercial dishwasher, Mach rack conveyor dishwashers are constructed entirely from double skinned AISI 304 stainless steel including stainless steel wash arms, tank filters and counterbalanced doors. A Stainless-steel double insulated boiler heats water rapidly and efficiently. Visualisation of tank and boiler temperatures with digital thermometers and temporised functioning by auto timer as standard that foresees the stopping of washing and rinsing functions when baskets are absent. The washing chamber is completely free to avoid stagnation and uses smooth rounded edges to avoid grease and debris build up. All stainless-steel filters inside the tank keep water fresher for longer. Easy tank draining by means of a front placed lever and/or an optional self-draining electric pump. Easy access to the electric components and washing pump through the front panel to make maintenance and servicing even easier. The conveyor has two different working speeds and can be easily reversed with rapid intervention and a safety system alerts operators to issues and halts operation. Operators gain simplified control of the dishwasher through sole switch controls on all functions. Outlet tables, with or without shelving and rollers. Price listed for base unit only. Please contact our specialist rack conveyor dishwasher customer services team to speak to one of our fully trained product consultants whom would be happy to discuss your requirements and provide a free no-obligation all-inclusive quote.